Convert to Judaism and martyr at Rome. An early branch of the imperial Flavian house was at one time inclined toward Judaism and Christianity. Even Titus Flavius Sabinus, Vespasian's elder brother, led during his last years a life that may be called Jewish or Christian. One of his four children, Titus Flavius Clemens, later consul and martyr, married Flavia Domitilla, who was a granddaughter of his uncle, the emperor Vespasian, and therefore a cousin of Titus and Domitian. 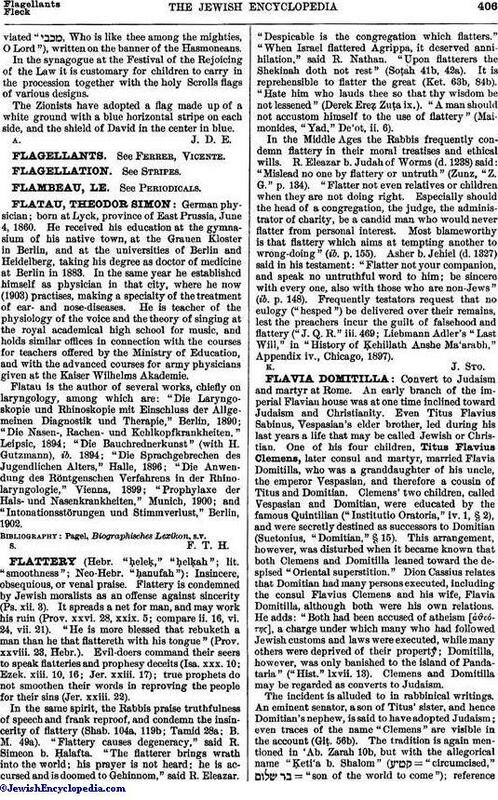 Clemens' two children, called Vespasian and Domitian, were educated by the famous Quintilian ("Institutio Oratoria," iv. 1, § 2), and were secretly destined as successors to Domitian (Suetonius, "Domitian," § 15). This arrangement, however, was disturbed when it became known that both Clemens and Domitilla leaned toward the despised "Oriental superstition." Dion Cassius relates that Domitian had many persons executed, including the consul Flavius Clemens and his wife, Flavia Domitilla, although both were his own relations. He adds: "Both had been accused of atheism [άϑεότση], a charge under which many who had followed Jewish customs and laws were executed, while many others were deprived of their property; Domitilla, however, was only banished to the island of Pandataria" ("Hist." lxvii. 13). Clemens and Domitilla may be regarded as converts to Judaism. The incident is alluded to in rabbinical writings. An eminent senator, a son of Titus' sister, and hence Domitian's nephew, is said to have adopted Judaism; even traces of the name "Clemens" are visible in the account (Giṭ. 56b). The tradition is again mentioned in 'Ab. 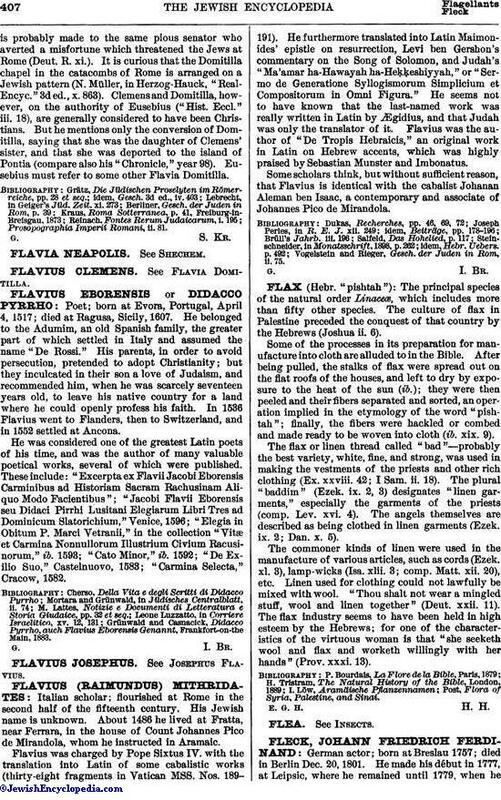 Zarah 10b, but with the allegorical name Ḳeti'a b. Shalom" ( = "circumcised," = "son of the world to come"); referenceis probably made to the same pious senator who averted a misfortune which threatened the Jews at Rome (Deut. R. xi.). It is curious that the Domitilla chapel in the catacombs of Rome is arranged on a Jewish pattern (N. Müller, in Herzog-Hauck, "Real-Encyc." 3d ed.,x.863). Clemens and Domitilla, however, on the authority of Eusebius ("Hist. Eccl." iii. 18), are generally considered to have been Christians. But he mentions only the conversion of Domitilla, saying that she was the daughter of Clemens' sister, and that she was deported to the island of Pontia (compare also his "Chronicle," year 98). Eusebius must refer to some other Flavia Domitilla. Prosopographia Imperii Romani, ii. 81.